§46.116...The information that is given to the subject or the representative shall be in language understandable to the subject or the representative. No informed consent, whether oral or written, may include any exculpatory language through which the subject or the representative is made to waive or appear to waive any of the subject's legal rights, or releases or appears to release the investigator, the sponsor, the institution or its agents from liability for negligence. §46.111(5) Informed consent will be appropriately documented, or appropriately waived in accordance with, §46.117. See the section on Regulatory Requirements. Informed consent is a process and not simply a document. The ICF informs prospective participants of the purpose, procedures and risks and benefits of participation, it serves as a guide during discussions with the investigator and as a reference source during participation. This section of the IRB's website provides guidance for investigators preparing consent documents. The IRB provides template consent documents but any format that is both readable and understandable is acceptable. For example, if the sponsor provides a template consent form, it can be used as the basis for the CHOP informed consent form (ICF). However, the IRB cannot approve a consent document that is not written in readable, understandable language or formatted in an approachable style. What Needs To Be in the Consent Form? The Common Rule and the FDA have different required and additional elements of consent. The Common Rule requirements 45 CFR 46.116 are listed above. The FDA's requirements are available in 21 CFR 50.25. The IRB checks to see if the required and applicable optional elements are present in the submitted consent form. When the consent document and HIPAA authorization are combined into a single form, then the ICF must also contain all of the requirements for HIPAA Written Authorization The IRB's Consent Form Templates contain all of the required elements and help guide the construction of a readable document. An example Consent Form is available on this site which shows where the regulatory requirements are incorporated into our consent template. In some circumstances that IRB can waive the requirements for documentation of consent. This is often confused with Waiver of Consent. When the IRB issues a waiver of documentation of consent, the IRB approves a consent form that contains all of the required elements of consent(above). The consent form is presented to the subject either in person, over the telephone, or electronically, and the investigator then must document that the consent process took place. See Waiver of Documentation for more information. HHS regulations at 45 CFR 16.116 and the FDA regulations 21 CFR 50.20 also require that the consent information be in language understandable to the subject or their legally authorized representative. This means the document must be written in plain language, using lay terms, and in a language the subject understands. Language the subject understands is interpreted to mean at a level compatible with their reading comprehension. The following sections outline the most common problems that result in requested changes. ICFs are often too long, use medical terminology rather than lay language, and are written at too high a grade level. Investigators should aim for a 6th-8th grade reading level. Many readers cannot maintain their concentration or comprehension when an ICF exceeds 6 pages. Even when written at a 6th grade level 20 - 30% of prospective subjects will be unable to read the document. 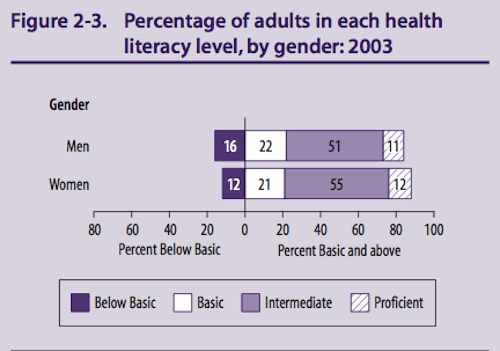 The two figures below are from the 2003 Health Literacy Statistics. The FDA's 2014 Draft Guidance: Informed Consent Information Sheet discusses what language understandable to the subject means and points out the US adults are also severely challenged by low levels of numeracy. “Understandable” means the information presented to potential subjects is in a language and at a level the subjects can comprehend (including an explanation of scientific and medical terms). In ensuring that information is understandable, it should be noted that more than one-third of U.S. adults, 77 million people, have basic or below basic health literacy. 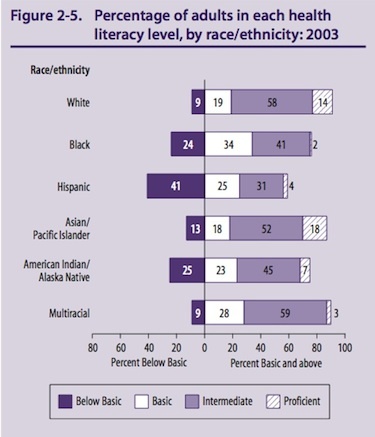 Limited health literacy affects adults in all racial and ethnic groups. In addition, more than one-half of U.S. adults have basic or below basic quantitative literacy and are challenged by numerical presentations of health, risk, and benefit data. The formatting, design and layout of the ICF has been shown to be one of the most important factors that affecting readability. (See for example Tait et al. Informing the uninformed: optimizing the consent message using a fractional factorial design.) Small type, wide margins, lack of white space and inconsistent typeface usage can all make the ICF less readable. A consistent approach to the layout and design of the ICF helps the reader understand the organization of the information and this contributes to understanding. A number of formatting techniques have been shown to enhance readability. All of these have been built in to the CHOP Consent Form Templates. The IRB's informed consent form (ICF) and protocol templates contain customized styles to ensure consistent formatting. In the case of the protocol templates, they also ensure that the sections are numbered appropriately. To do this, the templates contain a collection of styles, each of which is pre-formatted for different parts of the document. Each part of the ICF and protocol template have a corresponding style which includes the font, the margins and the line spacing. For example, Heading 2 in the ICF template is Arial 12 point bold. Instead of formatting a section of text, (e.g., making text bold, or adjusting the line spacing), the correct style intended for that section of the document should be applied. Cutting and pasting from another document will result in numerous paragraph styles, with a mixture of text sizes, and paragraph spacings. This happens because when text is pasted it brings with it the formatting from the original document intact. To prevent this problem, cut and paste using the Paste Special command and choose the Unformatted text option. For additional information about using Style Sheets and links to Microsoft tutorials, see Preparation for Study Submission page. See the Example Informed Consent Form for a practical application of the formatting techniques described below. Write in the second person, using 'you' throughout. Using the first person has been shown to be coercive. When children are subjects of the research, and most will be capable of assenting to participation, use 'you' to refer to the child. When most or all of the subjects will not be capable of providing assent (e.g. because they are under the age of 7, have cognitive deficits, will be sedated, etc. ), you may use 'you' to refer to the parent or guardian and 'your child' to refer to the child. Be sure to edit carefully to avoid unnecessary repetition and poorly formatted documents when cutting and pasting from a sponsor's ICF template into the CHOP template. To meet the regulatory requirements for approval, the IRB must find that the selection of subjects is equitable. The investigator must either (1) justify why they are excluding LEP subjects or (2) develop a plan to allow their enrollment. For more information on translated consent forms, see Equitable Selection, Short Form Consent, and IRB SOP 701: Required Elements of Consent and Documentation of Consent. The Group Health Cooperative in Seattle has assembled training materials for writing in plain language. Their Plain Language Toolkit is an 81 page document with numerous before and after examples. They also provide PRISM Online Training, which is an hour-long, Web-based plain language tutorial created for research professionals, including scientists, research staff, Institutional Review Boards (IRBs), or communications staff. It covers health literacy and readability, plain language strategies and examples, and interactive editing examples and exercises. Access the course for free at http://prism.grouphealthresearch.org. Download the Glossary of Lay Terms for lay language replacements for technical terms and jargon. Readability tools are available for free at - http://www.storytoolz.com/readability. The best estimate of the reading difficulty of consent forms and other health-related content is the SMOG scale. MS Word can calculate readability statistics using the Flesch Reading Ease Score.The Flesch-Kincaid Grade Level score rates text on a U.S. grade-school level. Unfortunately, this scale underestimates the reading level of health-related text by one to two grade levels. If the Flesch-Kincaid is used, it is safest to add 2 grade levels. The preferred tool to use for assessing the readability of health-related information is the SMOG (Simple Measure of Gobbledygook). Bjorn et al. Can the written information to research subjects be improved?--an empirical study. Coyne et al. Randomized, controlled trial of an easy-to-read informed consent statement for clinical trial participation: a study of the Eastern Cooperative Oncology Group. Sharp. Consent documents for oncology trials: does anybody read these things? By regulation, the informed consent form (ICF) must contain certain basic information and may contain additional elements if they apply. If broad consent will be obtained, additional information and optional elements, if they apply, must also be included. Investigators should check the ICF to make sure that each required element and any applicable additional element has been included. Additional elements should only be included when they provide information that could impact a potential subject’s decision to participate. The templates on this page are intended to help investigators construct documents that are as short as possible and written in plain language. The consent form (ICF) templates provided by the IRB comply with federal regulations and HIPAA. The IRB will accept and approve an ICF that differs from the templates, provided that the document contains all of the required and any applicable optional elements and it is well written. There are other webpages devoted to providing guidance for writing readable, compliant ICFs. It is up to the IRB to determine when assent is required and when it is, the way it should be documented. To document assent, some IRB's require the use of an assent form. The CHOP IRB's prefs that investigators document each child's assent on the consent form and prefers that investigators not use a separate form. On the consent form, the signature of the child is left optional. We prefer that investigators focus on the assent process rather than on getting a signature on a form. The abilities and needs of children vary widely and investigators should provide the information in a format tailored to the child in front of them. Short form consent is an alternative to using a translated consent form. The short form consent form is a document, translated into the subject's preferred language, that contains a description of the required elements of informed consent and notes that these elements, as they pertain to the study, will be presented orally to the subject or legally authorized representative. The short form document templates are available on the Short Form Consent Templates page. The Electronic Signature Standards in Global and National Commerce Act (Public Law 106-229 - June 30, 2000) also known as E-SIGN or ESIGN, established the standards for electronic signatures that could be used for transactions. An e-signature that meets the criteria for ESIGN is considered valid for the purposes of documenting consent and for HIPAA authorization.